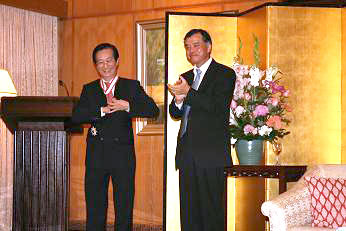 On 3rd November 2007, the Government of Japan decided to confer the Order of the Rising Sun, Gold and Silver Star, on Mr. Philip Yeo, Chairman of SPRING Singapore in recognition of his significant contributions in promoting economic relations and scientific and technological cooperation between Japan and Singapore. 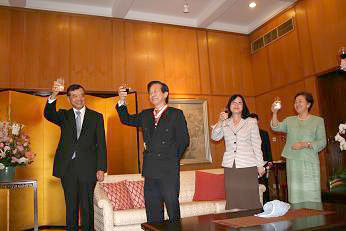 The Conferment Ceremony in commemoration of the conferment on Mr. Yeo was held on 19th December 2007 at the Japanese Ambassador’s residence. 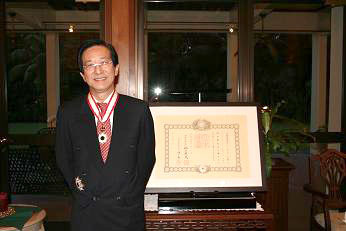 Approximately 50 of those who have close relations with Mr. Yeo and his activities and contributions from the Singapore government, research institutes and Japanese companies attended the ceremony, and celebrated his accomplishment.